So, it is the start of a new project and new adventures after a short break at the beginning of my Nomadic journey in Cape Town, South Africa. The first of these adventures led me to a place that I have been dreaming about visiting since 2013, the ghost town of Kolmanskop in Namibia. This was to be the start of my new series photographing the best Ghost Towns the world has to offer, a series that I am also documenting through a behind the scenes video series over on my YouTube channel -it will be a long completion process with the photography series due to take a few years to complete. So here we are in the dry and barren Namib Desert in Southwest Africa and once we obtained our permits, we were faced with the bones of a grand town which has become swallowed by the desert. It was once the home to hundreds of German miners desperately seeking their fortune in the Namibian desert. 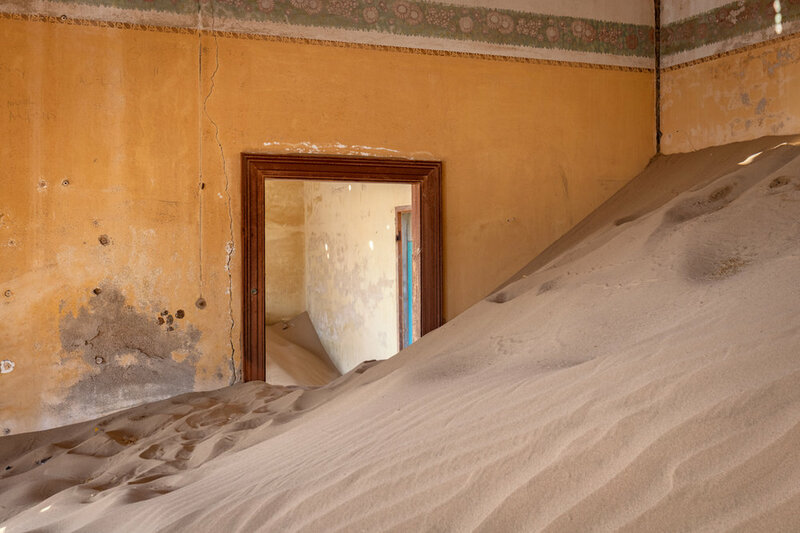 But almost 100 years after Kolmanskop peaked as a thriving and bustling diamond mine, it is now a dilapidated ghost town slowly being reclaimed by the sand. In 1908, while working in the heat of the desert on a railway Mr Zacharias Lewala found a diamond while working in this area and showed it to his supervisor, the German railway inspector August Stauch. Who then proceeded to purchase the surrounding land in a sneaky move which made him filthy rich for years to come. After the Namibian government caught on and realising the area was rich in diamonds, German miners began a settlement and soon after the German Empire declared a large area surrounding the town a “forbidden zone” now known as the "Sperrgebiet", and formally Diamond Area Number 1. They then started to exploit the diamond field. In the town’s heyday, the precious stones were so easy to find that they could be picked out of the sand with ease and workers armed with jam jars would crawl on hands and knees, filling them with diamonds. These days the Sperrgebiet spans along the Atlantic Ocean-facing coast from Oranjemund on the border with South Africa, to around 45 miles north of Lüderitz which is over 200 miles north. The Sperrgebiet extends to around 62 miles inland as well and its total area of 10,000 sq. miles. However, mining only takes place in five percent of the Sperrgebiet, with most of the area acting as a buffer zone and members of the public are banned from entering most of the area, despite the creation of a National Park there in 2004. In February 2019 I visited over three days, twice in early February and once two weeks later on-route back to Cape Town, South Africa. On each occasion that I visited the weather was different, it was hot and humid on the first morning then overcast and foggy on the second morning a day later. Two weeks later and we were faced with a cool and breezy morning which made the visit pleasant and enjoyable. The first day was more of a fact-finding mission, as I looked for the best photography spots as well as the best places to shoot some video for my YouTube channel. I spent the day shooting rooms and buildings as I came to them and it took a solid day for me to tick off each of the images that I wanted in my portfolio. Day two consisted of shooting the video guide and YouTube video, however the day was to prove to be extremely challenging. First there was the fog, it was thick and did not exactly make my videos contain the “desert” feel. But once this lifted it was the hottest day of the three, which was not ideal when I was supposed to be outside buildings shooting a guide - I became sun-burnt and fast (I mean come on, I am of Irish decent!). I had completed the majority of the video guide; however I was left with a tinge of disappointment regarding some of the footage. Then a week after we had left the area (some 1500km further North) we discovered that Jade (my partner) had lost her images from day 1 in the town (because of a faulty memory card) so we made the decision to return to the Lüderitz region and sacrifice heading to the Fish River Canyon viewpoints. The thing with slowing down and travelling full-time is that you want to make quality content and a decent product. So, returning to Kolmanskop allowed me the opportunity to be happy with my results. I would always advise anyone to slow down or even to spend longer in one spot - it is always worth it in the end and I prefer this way of photographing and documenting places rather than the “run and gun” style many people in the abandoned genre now do things. So, two weeks later and I returned for an unplanned visit to the ghost town. And it turned out to be a very pleasant morning, with a nice sunrise as well as a cool breeze. Once the sun was up the temperature was also lower than two weeks previous as well which allowed me to breeze through my new shot list that I had compiled for my video guide. Once I shot the missing parts for the said guide, I looked for “other” photos in the buildings once done I then decided to shoot my YouTube video intro for a second time as well. Photographing Kolmanskop on each day was a pleasure, the sand filled rooms were the stuff of dreams. And some rooms had multiple compositions and images on offer. Cleaning my tripod afterwards was the biggest challenge, the sand honestly gets everywhere. A stunning room, I spent around an hour inside here - every time I moved my camera I liked the new composition more than the last. This composition was difficult and required laying on a stack of sand that was on a slope and digging my tripod into the mound as well. Originally I thought this building offered noting, how wrong I was. The light in this room is fantastic during the middle of the day because of the gaps in the wood, what a unique feature for a derelict place. A surprise inclusion perhaps, but I love the burnt tones of this out-house. Wow, what can I say? This room makes any trip to Kolmanskop worthwhile. But it is not as easy to find as one would think. 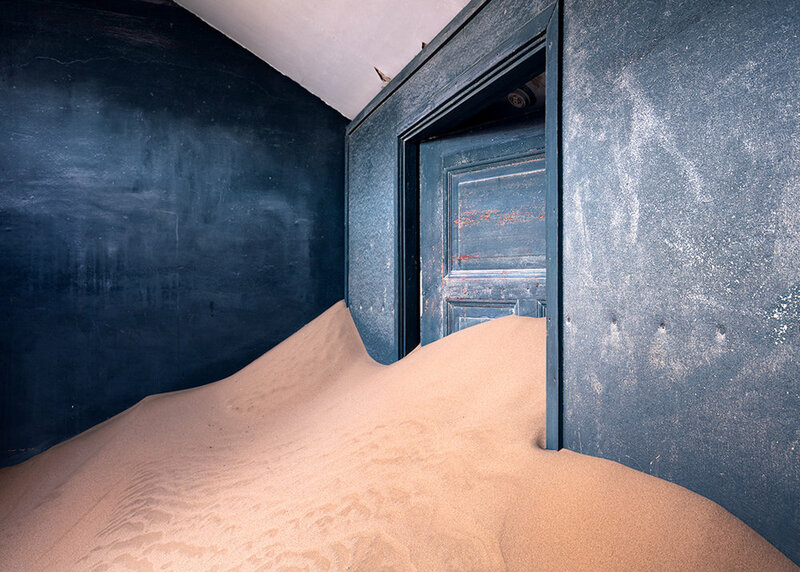 Tourists and photographers alike now flock to Kolmanskop to see the Ghost Town, but it is not always as simple to do that as first meets the eye. Permits are often confusing especially if you are looking to sell images at a later date, as I was wanting to do. So to help you I have produced a short blog post on accessing the forbidden area of Kolmanskop but in addition to this I have produced a NEW downloadable video guide for photographers and videographers which will be available here on my website in the coming weeks. In my video guide, I discuss everything from how to obtain the correct permit and to gain access at sunrise and sunset but more importantly I also provide a guide into the best locations and rooms to photograph - something that I found very difficult to obtain information about prior to visiting. And for the first time ever I have produced a photography (in camera) and editing tutorial of two of the rooms found here at Kolmanskop. This allows my downloadable video to be used as a tutorial as well as a guide. My Tenba Shootout 32L rucksack in sand filled building number 10. Tips on what to expect when visiting. Where to obtain photography permits or day passes. Information about the guided tours. A more in-depth history section. 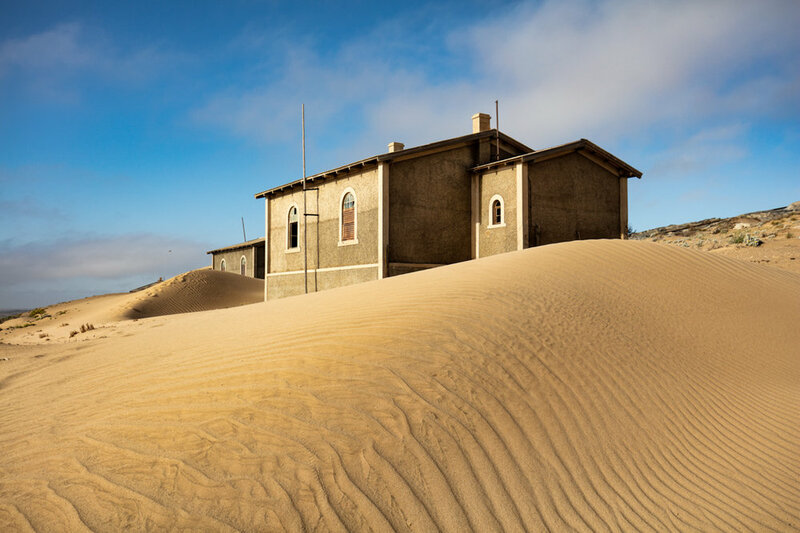 How to get to Kolmanskop and where to stay. What to take & what to wear. Information about the official tours of Kolmanskop. Information on commercial licences when visiting the ghost town. The associated costs of visiting. The best times to visit for photography. Photography tips for keeping gear sand free. Tips of which rooms currently have a sale value for prints/art. Photographing and editing images from Kolmanskop, Namibia. A detailed map showing the location of each of the best photographs and which buildings they are in. A list of buildings that are a waste of your time to visit (using numbers on the map). A map and photography guide to a hidden car that is closely linked to the history of the diamond town, located in Aus. Be alerted when the guide is live! Thank you, I am weeks away from uploading the guide - I shall be in touch once this guide is online! I shot these images with the following gear: (please be aware that these are affiliate links , by using them, if you purchase equipment or goods it costs you nothing more but I do receive a little kick back which supports me and my work).